It turns out that happy ever afters really do exist outside of classic Disney flicks. At least that’s if you take Idaho Falls native Tia Vargas’ story as proof. 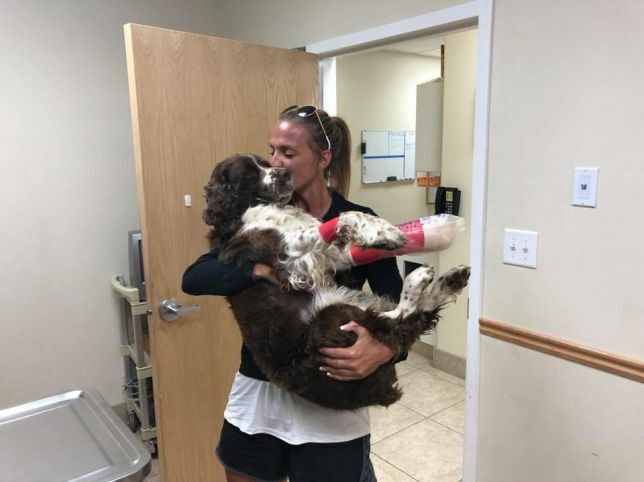 The 40-year-old was hiking down the peak of 11,000-foot Table Rock Trail in Boise’s Grand Tetons on the way to meet her father last month, when she came across an alarming sight: an injured English springier spaniel struggling to keep pace with another pair of hikers who were searching for the dog’s owners. It wasn’t enough for Tia to simply take responsibility for his safe passage down the mountainside. They now live together, with the 55-pound pup named Boomer and formally adopted by the family. However, such a heartwarming outcome wasn’t always on the cards. ‘His eyes were super puffy and bloodshot. His body was swollen, even his bum was very, very swollen,’ she told ABC News. ‘And you could tell he was very dehydrated. He had cuts and scratches on his belly and on his head. 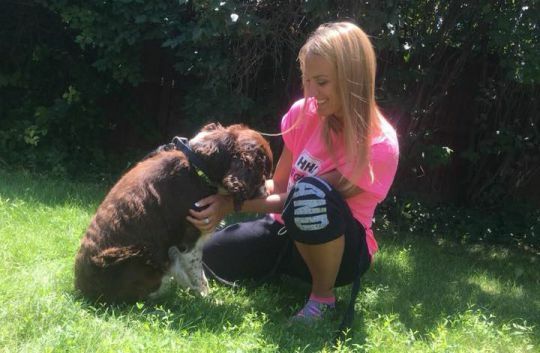 He was in bad condition.’ Faced with the injured pup, Tia knew what she had to do. Even if it wasn’t going to be easy. ‘I felt the difficulty of it right away. I never felt 55 pounds like that before,’ she told Mother Nature Network. Luckily, it wasn’t long until she came across her father, Kasper, whose quips gave her a much needed boost. Dad laughed and said, “Isn’t this hike hard enough? You have to carry a dog too?”‘ said Tia. ‘My dad makes me laugh. He is such a great man.’ But it wasn’t to be the last challenge. Just as the father-daughter team were making headway it began to pour with rain. Hours passed until the intrepid trio finally made it down to the bottom of the mountain at 6pm. It wasn’t long until they noticed a sign Boomer’s family had left for the missing pooch. 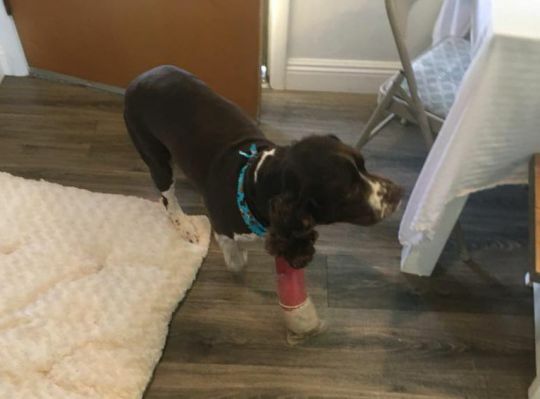 After getting in contact, the pair soon learned that Boomer’s people had lost the dog while hiking up Table Rock Mountain on 4 July, where he wandered off and fell 100 feet down a snowy crevice.